The FX thriller American Horror Story: Coven wrapped up its season on January 29. According to Entertainment Weekly, it averaged 4 million views, more than its previous seasons (Murder House averaged 2.8 million and Asylum average 2.5 million views). The third season of this self-containing miniseries centered on witches and voodoo practitioners in New Orleans, Louisiana. If you loved Coven, you’ll love Spirits of New Orleans, a “paranormal road map to all things voodoo and vampire in New Orleans”, according to Bookish writer Jordon Scott. Spirits of New Orleans explores the haunted history, paranormal activities, magical ceremonies, and supernatural rituals and practices that have haunted New Orleans for many years. 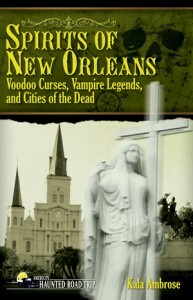 Join author, intuitive, and oracle Kala Ambrose on a journey into the exciting history of New Orleans. America’s Haunted Road Trip is a one-of-a-kind series of haunted travel guides. Each book profiles 30-100 haunted places open to the public. From inns and museums to cemeteries and theaters, the author visits each place, interviewing people who live and work there. Books also include travel instructions, maps, and an appendix of 50 more places the reader can visit. This blog post was written by our intern, Robyn Campbell.